The theme for February in the Bitty Block Committee was text/word or trees on a white background. 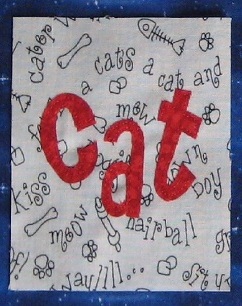 I had this cute cat/dog background fabric so I made cat and dog blocks. The fabric was too perfect to not use! I knew I wanted to do spring trees and when they were done, they were too plain. So I cleverly (I thought at the time) added a swing to each one. Little did I know, so did a couple of the other swappers! I'm not nearly as clever as I think. My husband told me to add a tire swing, but I thought that was too boyish. lol I should have listened to him! DON'T tell him I said that! They came out pretty cute, though, I think. I made Alexander the Grape. We all had to make 14 of our guys/girls. I used one of my left over red bird bitty blocks and made this mug rug, but I suspect it'll end up on a wall instead of under a cuppa. I love how it turned out. I'm doing another one right now with one of my little kite-flying hedgies. If this one is winter, the hedgie is spring. And I was in another swap, the theme was "Take Flight" and my 8 year old partner, Max, made me this wonderful "The Flight of the Rainbow Balloons" mini quilt. I absolutely love it and I hung it up on the wall just the left of where I sew upstairs. Every time I turn my head, I am delighted by it! 8 years old, can you believe it? He's going places, that Max! Such talent. His mom is amazing, so I am sure he gets it from her. You might know her- she goes by lolablueocean at Flickr. The back is wonderful, too, look at that great label! I sent him a quilt of a dragon carrying a little boy over a castle town, in the night. I think we were both pleased with our swap! He's a great kid and I hope to swap with him again, but I know he's going to be in high demand! So that's what I've been doing, along with making things for my shop. I need to get those listed! Off to the salt-mine! My taste is exactly what comes through your fingers. Just when I think you have topped yourself, there is something else to change my mind. Love the colors, textures and ....all of it. Egads, Flossie - every time I think you've made something amazing, you go and top it again!